I had never owned a horse before, it just seemed like an unattainable dream when I was growing up a townie in the UK, my contact with them was limited to holidays and farm visits. Moving to the Netherlands, did not bring the dream closer, until my little girl started pestering me for a pony, and we finally gave in after she sustained her campaign from the age of seven to the age of twelve with no letup.So after a search through the internet and to all four corners of this little flat country we ended up with our soft eyed, sensitive, gentle but powerful animal which was probably far too big for my daughter and made me for one quite nervous. We moved her into our current location, close to home, and just outside Amsterdam, and began to learn to be Horse People. Thankfully we met up with a group of owners as green as we were, and we all grew together, parents shielding their eyes as their kids steered these creatures round arenas at varying speeds, charged in “ controlled” gallop around the countryside and crashed through fences. But the parents role is much more hands on than that. 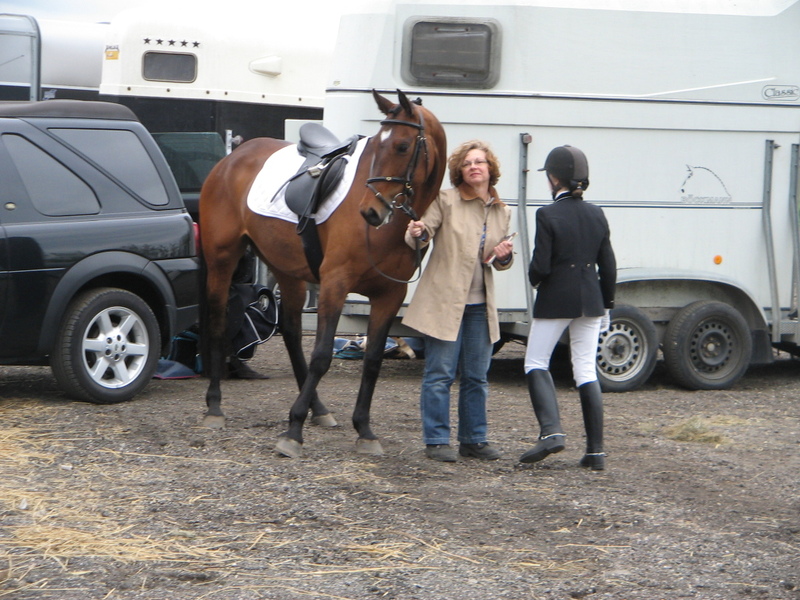 Its dad’s job to trailer the horse to competitions, when he has never ever towed anything behind the car, its mams job to make sure the horse is in the trailer, that the child is calm and focused, and not in floods of tears before they go into their test. It’s the parent who holds the horse steady for the farrier or the dentist (yes they need the dentist too). Every parent I know has stretched themselves beyond their boundaries, and become a more confident, assertive person through contact with these horses. Having our own horse has taught me so much about myself, about overcoming my own anxieties, developing my own self confidence. Whether riding her or simply looking after her she mirrors my feelings. When I am nervous she is jumpy, when I am calm she is calm too. SO why did I decide to use horses as a coaching tool? There are many reasons why i decided to combine my current coaching services with equine assisted coaching. I could tell you about the wonderful connection horses and humans have had over the ages, or the way that horses mirror not only your physical behavior but also your emotions. But the main reason is that over the years I have seen how being with horses really does help build self-confidence, set personal boundaries and give people the courage to try to aim for bigger goals. So whether you have experience with horses or not and you want to know more about how communicating with horses will help you reach your goals, come along to an introductory session and see how it works for yourself.